SPS senior Ian Rainey competing for NYU. Rainey recently on two national titles at the NCAA Division III Swimming and Diving National Championships. Ian Rainey capped off his collegiate swimming career in style at the 2018 National Collegiate Athletic Association Division III Swimming and Diving National Championships by winning two national titles over a two-day span. With the nation’s top finishes in both the 200-yard and 400-yard individual medley events, the historic feat made Rainey the first national champion in NYU men’s swimming and diving history. As fairytale-esque as the ending may seem, Rainey’s journey to the top of the Division III ranks was far from linear. The SPS senior began his collegiate career at the University of Michigan, where he exercised his first two years of NCAA eligibility at the Division I level. While representing the Wolverines, Rainey found success in the pool with a handful of top 10 finishes and a national championship. Although Rainey said he truly enjoyed his time in Ann Arbor, he decided to transfer out of Michigan because he wouldn’t be able to pursue his passion for real estate. Following his sophomore year, Rainey took a semester off from his studies to find a university that could best integrate his academic and athletic endeavors. After learning about NYU from his brother, who was a first-year at the Stern School of Business at the time, and visiting the campus to meet members of the swimming and diving program, Rainey decided to trade maize and blue for violet and matriculated to NYU in the spring of 2017. In his two seasons as a Violet, Rainey demonstrated athletic excellence by setting multiple school records, garnering All-American honors and winning two national championships. Assistant swimming coach Erica Belcher credited Rainey’s success in the pool to his humble character. Rainey said that the individual acclaim of his national championships pales in comparison to the impact those awards will have on the future of the swimming and diving program. When asked about the impact Rainey’s legacy will leave on the program, Head Coach Trevor Miele made it clear that Rainey’s success will set expectations that will elevate the program’s commitment to becoming a top-tier program in the nation. Teammate and Gallatin sophomore Giorgio DelGrosso said that the underclassmen are now tasked with stepping up to address Rainey’s departure. 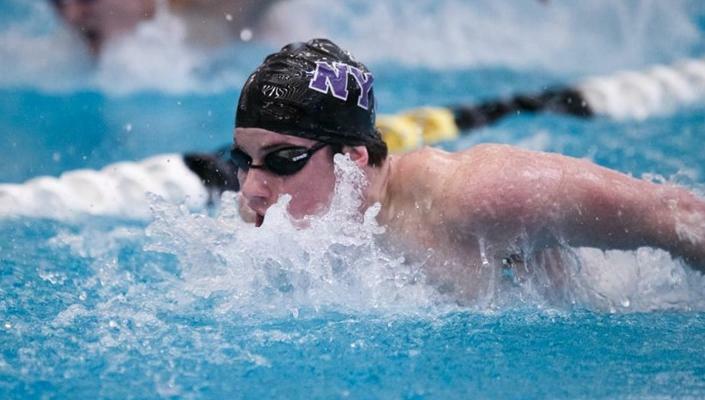 In further speaking to the impact of Rainey’s legacy, swim captain and Stern senior Tim Kou added that he believes Rainey’s success will prompt more top transfers and recruits to consider competing at both NYU and at the Division III level at large. Having exercised all four years of his collegiate eligibility, Rainey will step away from competitive swimming for the first time since he began competing at age six after he graduates. His numerous records, championships and athletic honors will be permanently cemented in the history books, and Rainey’s impact on the NYU swimming and diving program will extend far beyond his time as a Violet with current and future generations of swimmers being held to the expectations he set both in and out of the pool as an athlete and teammate. This summer Rainey will work as a property management intern at Related Companies before returning to NYU next school year to complete a Bachelor’s of Science degree in Real Estate and cheer on the Violets from dryland.